Have your soils been bare most of the winter and temperatures well below zero? 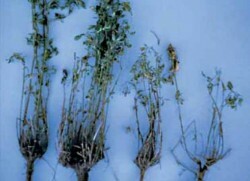 If so you should be evaluating your alfalfa fields for winter injury early in March. Download this PDF for more information.